Prepare to enter a world full of richly imagined mythology - a world where dark and dangerous heroes fight to protect us. Prepare to lose yourself . . .
Dark-Hunter Wulf is an ancient Viking warrior with a useful but extremely aggravating power - amnesia. No one who meets him in person can remember him five minutes later. It makes it easy to have one-night stands, but hard to have a meaningful relationship, and without true love he can never regain his soul. Then he meets Cassandra, the one woman who can remember him. However, as the princess of the cursed race Wulf is sworn to hunt, she is forbidden to him. Kiss of the Night is the fifth book in the Dark-Hunters series and another fabulous book by Sherrilyn Kenyon. I have been absolutely devouring these books since I started them and the only reason I'm happy to be so late joining the DH bandwagon is that I've got so many books to work my way through before I'll have to start waiting between instalments like everyone else! I was a little confused when I first started reading this one because the time line for the story starts at around the same time as events in book 3, Night Embrace. I was worried that I'd somehow ended up reading the books in the wrong order but it doesn't take long for events to catch up and overtake the previous books. We hadn't seen a great deal of Wulf in the previous books but I found myself quickly coming to like him. Thanks to a curse placed on him Wulf has a very unusual effect on anyone he meets, apart from members of his family any human he comes across forgets everything about him within 5 minutes of their meeting. As soon as Wulf walks away he is wiped from their memory which makes it incredibly difficult to form any kind of lasting friendships or even interact with members of his staff. Other than his fellow Dark-Hunters the only person who remembers him is his distant nephew Chris. Wulf drives Chris insane with his overprotective ways and thanks to the pressure he puts on him to produce an heir but the two of them have a strong bond and there is a lot of love between them. It was actually really nice to see one of the Dark-Hunters who still has a connection to his family centuries after he became immortal but you can imagine how hard it must be for Wulf to watch his family members continually age and die while he always remains the same. The grief of losing so many people has changed him and Wulf finds it hard to let people get too close. When he first meets Cassandra he has no idea who she is or that she is an Apollite and therefore one of his greatest enemies. He saves her life almost by accident and never expects to see her again but when their paths next cross he is shocked to discover that she remembers him. That is something that has never happened before and instantly draws him to her, until he finds out about her heritage that is. Cassandra knows very little about the Apollites other than the fact that they killed her mother and her sisters and that they have spent years hunting her too. She doesn't understand why they are after her but she wants to make the most of the time she has left before hitting her 27th birthday kills her. Wulf is torn by his protective feelings towards Cassandra when who she is makes her automatically his enemy. She makes him question everything he has ever been told about the Apollites and he doesn't know what to do with the new information. I have to say I loved the way Cassandra stood up for herself and her people, she makes it very hard for readers not to sympathise with the Apollites and even to a certain extent the Daimons which is something I wasn't expecting. I don't want to say too much more about the story other than the fact that I loved it. Wulf and Cassandra have a very difficult journey to face and it seems almost impossible for them to have any kind of happy ever after but thankfully Sherrilyn Kenyon is able to masterfully turn things around for them both. It was also great to catch up with some of the characters we already know and love and see how they're getting on. I'm falling more and more in love with Acheron every time he steps onto the page and I absolutely can't wait for his book! 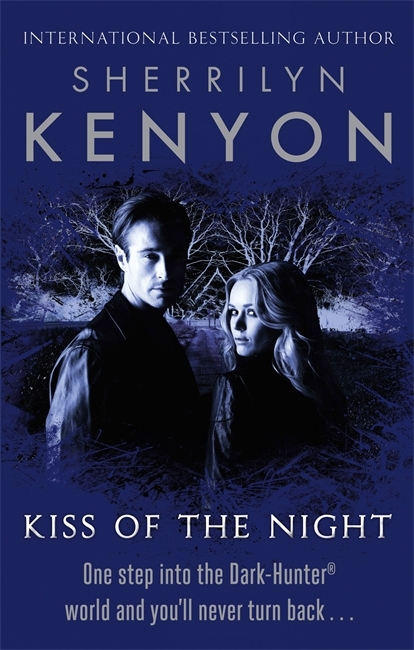 Kiss of the Night is a fantastic instalment to the series, a really emotional read that tugs at your heartstrings and will completely change your opinion of certain characters by the end. I can't wait to find out what happens next!